The Neo-Pure CTOCL-4520 Coconut Shell Carbon Block Filter Cartridge specially designed using eco-friendly activated coconut shell carbon, which ensures the highest level of chlorine taste and odor, cyst, and lead reduction. Each block is wrapped with a polypropylene outer layer and netting to prevent premature clogging of the carbon block. NSF Certified. 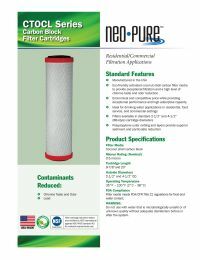 The Neo-Pure CTOCL-4520 Coconut Shell Carbon Block filter cartridge for chlorine reduction is NSF 42 Certified for material requirements only. Made in the USA. The Neo-Pure CTOCL-4520 Coconut Shell Carbon Block filter cartridge for chlorine reduction is proudly made and manufactured in the USA. Eco-Friendly. Made from earth-friendly coconut shell carbon block, the Neo-Pure CTOCL-4520 is perfect for the earth-conscious consumer. Long Filter Life. With a filter life of 16,000 gallons @ 4 gpm, the Neo-Pure CTO1-4520 cartridge lasts much longer than most compatible filters. Sediment and Particulate Reduction. Polypropylene outer netting and layers provide superior sediment and particulate reduction. High Quality, High Value. This filter offers an economical and competitive price while providing exceptional performance and high capacity. Ideal for Many Applications. The CTO1-4520 is ideal for use as a reverse osmosis prefilter or postfilter. The filter media meets FDA/CFR Title 21 regulations for food and water contact, making them an excellent choice for residential, food service, and commercial drinking water applications. Superior Contaminant Reduction. The Neo-Pure CTO1-4520 cartridge is manufactured using coconut shell carbon for improved reduction of chlorine taste and odor, as well as cyst, lead, and turbidity. Cartridge Dimensions: 4.5" x 20"